Do you have a go to method for chicken tacos? I have a few favorites. Two of my favorites are cheddar beer chicken tacos and salsa verde chicken, but my all time favorite is Taco Ranch. I do not know what it is about this flavor combination, but I absolutely adore for our tacos. The meat is so flavorful and juicy, and is always raved about when I bring it for a taco bar at work. Kellen really like shredded chicken and goes nuts for this stuff. He especially liked it with rice or couscous as a meat carrier system. Tonight we are having a low key night at home before a busy weekend. On Saturday, we are going to a pumpkin walk with my sister in the morning and a Halloween event at Heritage Hill with friends in the evening. I am excited because Kellen gets to wear his Triceratops costume for the first time and it is soooo freakin' cute! On Sunday, we are dropping Kellen off and heading to the Packer game with my cousins for a bright and early tailgate followed by the football game. I am so excited! It is my first Packer game of the season and I am so pumped! Place chicken breasts into crockpot. Mix remaining ingredients into a medium bowl and pour over chicken. Stir to coat. Cover and cook on low for 8 hours. Remove chicken and shred. 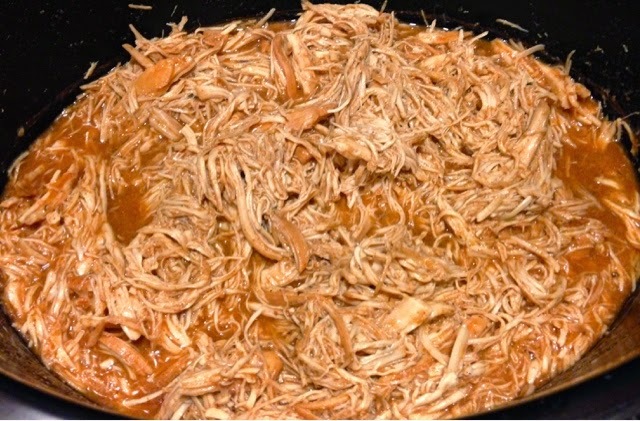 Return chicken to crockpot and cook for an additional hour. Use for tacos, sandwiches, salads or wraps.